Another gig at MK Dons, this time for their family day against Carlisle United involving a coach trip up with a big band of 40 people. 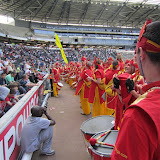 On arrival we went straight to a rehearsal walking round the pitch and playing some MK Dons specific arrangements, then just time for one of our famous Bloco Fogo Picnics. Then the start of the performance, we played outside the gates as the crowds arrived, then at the main stage arena and then straight into the ground for a parade around the pitch before the game began. Forced to walk in two by two's we had a very long band which obviously presents challenges as the sound delay kicks in. Managed to get the crowd chanting with some simple football rhythms and then off to the stands to watch the first half of the match. Finally back onto pitch side for the half time set, a quick 5 minute blast of Bave mixed with some MK Dons chants then back on the coach home.